Is an SUV Right for Me? 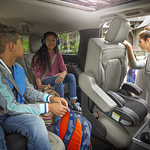 The temptation to downsize your vehicle is may be strong, but SUVs have plenty of features that make them an irresistible choice for drivers. From offroad capability to towing capacity to a roomy passenger cabin, an SUV might be the right choice for your lifestyle. The main concern for drivers might be gas mileage, but efficiency standards have improved across the board and there are many SUVs boasting 30 or more miles to the gallon. If your hobbies include personal watercraft or ATVs, the towing and offroad capability of an SUV makes your weekend break that much easier to plan. It's also safer to be in a substantial vehicle if you're ever involved in a collision. If you'd like to test drive an SUV and see if it's the right vehicle for your needs, don't hesitate to visit us at Westend Hyundai. We've got plenty of models to choose from and can answer any questions you may have about the vehicle's many features.